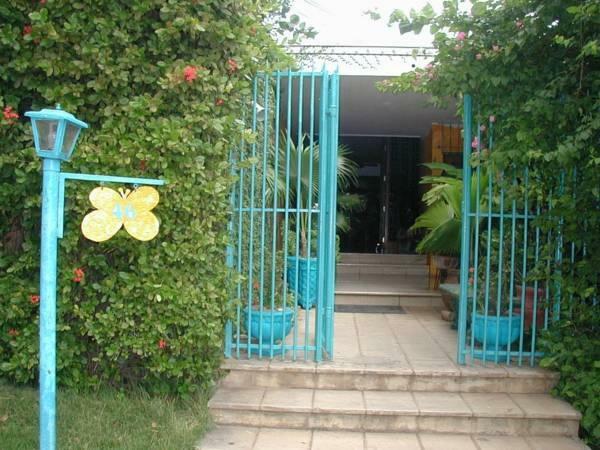 ﻿ Best Price on Hostal Real - Los Robles in Managua + Reviews! The Hostal Real Los Robles is located in the Zona Rosa district in Managua, where guests will find different restaurants, bars and shopping centres within 1 km distance. The hotel has outdoor pool and free Wi-Fi in public areas. The rooms at Real Los Robles are air conditioned, have cable TV and offer free toiletries. Wired internet connection is available in the rooms for free. The private bathroom may either have a tub or a shower. At Real Los Robles the breakfast is complimentary, and the on-site restaurant serves International-style dishes. The hotel also has an on-site bar. Downtown Managua is 10 minutes’ drive away, and Managua Shopping Mall is just 2 km distance. Taking a 5-minute drive guests will find cinemas and bars. Nice property. I appeared to be the only person staying there at the time as saw no others. Is behind a security gate so you have to be' buzzed 'in I felt a bit guilty coming in late a couple of times as had to wake up the receptionist to let me in. No one speaks English but not a major problem. Seems to be minimal number of staff maybe because it was not peak season. I seemed to have had the place to myself so had a dip in the pool a couple of mornings and had it to myself. It describes itself as having a bar and restaurant but saw no evidence of that it is on a much smaller scale than that. Room was pleasant-light didn't work in the bathroom but if I spoke Spanish am sure that could have been sorted easily enough. Area has bars and restaurants very close by and an Intercontinental but not too much else this isn't the fault of the hotel there isn't much to see in Managua in general as far as I could see. Staff helpful they ordered taxi to airport for me despite language difference. Man muss das kleine Haus erst einmal finden, zumal es auch noch ganz in der Nähe ein "Hotel los Robles" gibt. Das Hotel ist das frühere Wohnhaus eines Gernerals mit noch allen früheren Ausstattungen. die Zimmer sind alt, aber akzeptabel.